Let's take the 5 Minute Task Challenge. Ready? Second, put a star by each of the tasks that probably takes less than 5 minutes. Third, start a timer and do ONLY the starred tasks in order from the anticipated quickest task to the anticipated most-time consuming tasks. How many tasks did you accomplish? How long did it take? I accomplished all the starred tasks (7). It took, altogether, about 15 minutes. 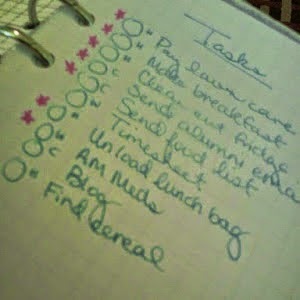 That means that most of the tasks on my list took about 2 minutes each! 2 minutes. Yet, the list was overwhelming me, because it was long and my brain was stuck on that length instead of being logical and realistic. In fact, several of those items have been recopied, day after day (likely spending more than 2 minutes per task recopying), as I've avoided tackling these 2 minute tasks! Task lists can paralyze you. Don't let them. The 5 Minute Task Challenge is meant to remind you not to freak out over a task list. This challenge should show you that you can get stuff done with very little time commitment. Once your list is made, just start somewhere. You can do like I did, and do the quickest task first. Or you can do the most dreaded or longest task first. Your system doesn't matter. What matters is that you have a plan, that you stick to it (unless there are GOOD reasons for change), and that you take care of business so that you have time left to enjoy your life! 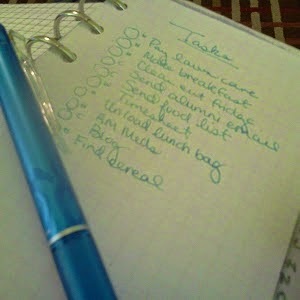 I have to say that I always start with my easier tasks, things that take (at the most) 5 minutes. Once my list is whittled down a bit, I don't feel so overwhelmed and I can concentrate on those items that will take a while to complete. If I do it the other way, starting with the hardest or longest tasks first, all I do is look at my long list and get frustrated that there is still so much there.